Nighthawk Custom, manufacturer of the world’s finest custom made 1911’s, is proud to introduce the newest model in their lineup, the Firehawk. The new pistol offers several advancements in the company’s long line of purpose-built innovation. Nighthawk Custom has utilized a recoil-taming single port compensator, a Bull Barrel and a full-length guide rod that adds weight to the front of the pistol to reduce muzzle rise. In addition, the Firehawk has a modified government length slide that has been shortened from 5” to 3.9”. A newly designed commander length spring and reverse plug system maintains the standard recoil impulse of a 5-inch 1911 for reliability. As part of its functional design, the Firehawk features a full Nighthawk Custom prep that incorporates a French Border to showcase the craftsmanship involved in blending the compensator and slide together. The closed front end of the compensator has been bull nosed for an easy draw and a custom touch. 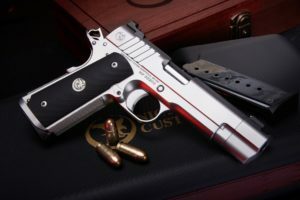 Nighthawk Custom has built a stunning custom pistol that has the functional benefits of a compensator, allowing for minimal movement of the front sight while shooting and allows for much faster follow up shots, while maintaining a classic appearance that will impress classic 1911 aficionados. The Firehawk has an MSRP of $4199.00 and is available with a nitride or stainless-steel finish in 9mm and .45 ACP.